What does it mean to be influential online? No doubt I’ve got all kinds of theories on how to measure online influence, and even went so far as to outline them a bit in this comment, but for now, I just thought I’d just share my excitement that Sarah Needleman of the Wall Street Journal wrote a great article about one of the theories I’ve been working on with the D&B Credibility team and the resulting list of the most influential twitter people in the small business community. Posted on June 29, 2011 October 4, 2011 Author Dustin LutherCategories Strategies, TwitterTags influence, small business, smallbiz, twitter, wsjLeave a comment on What does it mean to be influential online? Just walked out of the first Fusion event put on by the Better Homes and Gardens Real Estate crew… So much fun! I had a great time on stage yesterday with Jeff Turner, Gahlord Dewald and Wendy Forsythe talking internet marketing, building online influence, tracking and measuring results and the real value of conversations. My involvement was to give two presentations. The first on Building Online Influence and the second on 10 Things You didn’t Know You Could do with Your Smartphone. Both were a lot of fun to give and since I promised the audience I’d share linkes to each of the apps I mentioned in the latter presentation, I thought I’d share them in this post. Enjoy! And I’m always looking to deliver super-informative (and fun!) internet marketing presentations, so don’t hesitate to reach out if you hear of an interesting opportunity! It’s been a busy few weeks since returning from New Orleans and I’m just now getting around to posting my presentations on Slideshare. How you can get value out of tools like Gist by focusing on building and enhancing the relationships that are most important to your business. Interestingly, in the last few days, I’ve started to nail down more than a few speaking engagements for this upcoming spring. I’m always interested in educating professionals on how to get the most value out of their online marketing, so if you know of someone looking for a speaker, don’t hesitate to reach out! Real Estate WordCamp is Coming to NARdiGras! I’ve been working with the NAR team to put together a WordPress event at NARdiGras, and couldn’t be more excited that we’re ready to start announcing details! In a nutshell, we’ve broken the half-day event into two tracks — one for beginners and one for more advanced WordPress users — and the folks we’ve agreed to present are some of the most knowledgeable WordPress people in real estate. All the sessions will be be on the morning of Monday, November 8th. Below is a summery of the schedule, although this page on the NARdiGras site will quickly become the definitive source of all session information soon! The idea is that if you’re relatively new to WordPress (and even if you don’t have a wordpress site yet! ), you should be able to leave the first track with enough knowledge to feel comfortable setting up a site and have an idea for what a successful website marketing strategy would look like. For those who are comfortable blogging, Todd Carpenter is going to be hosting the Maximizing WordPress track. With Kelley, Steve and Gahlord as presenters, you’re sure to get tons of tools and strategies to take your online marketing to the next level. I couldn’t be more excited to be heading to New Orleans again and look forward to seeing you there! Posted on August 19, 2010 August 19, 2010 Author Dustin LutherCategories Blogging, Events, Marketing Tools, Real Estate, Real Estate Industry Blogs, SEO, Sphere Building, Strategies, The People of Real Estate, Travel, WordPressTags blogging, conversions, nardigras, plugins, real estate, themes, tools, wordcamp9 Comments on Real Estate WordCamp is Coming to NARdiGras! REALTORS: You can use promoted posts to showcase your listings! Greg Vincent asked the seemingly obvious questions as to whether agents should use Facebook Ads to send consumers to their post about a listing or a page on their website featuring the listing. I’ve been buying Facebook Ads on-and-off for quite a while and have seen no evidence to suggest buying ads on Facebook makes any sense at all. Facebook is super-quick to take down non-performing ads (i.e. ads that people aren’t clicking on), and I just can’t image that the typical listing has any lasting value for consumers. If, and only if, Facebook someday figures out who is likely to move to a geographic area AND lets you target those people, I might change my mind. Looking from a larger perspective, at just about every presentation I’ve been giving over the past few months, I’ve been harping about how Facebook makes so much more sense as a sphere building tool than as a tool to reach your next client. If you’re curious why I make the distinction between reaching consumers directly and building your sphere, check out the Agent Business Cycle diagram. Based on countless interviews with agents (as well as my own surveys), I feel comfortable saying that the majority of agent business is generated from sphere building activities (whether they be reaching into an agent’s community or connecting with past clients)… and Facebook is the ultimate sphere building tool. Used “right,” there has never been a social network that will help you to reach new and relevant people (i.e. friends of friends/fans/followers) so easily, but when used “wrong,” Facebook will quickly take just about all your influence within your network. So what do “right” interactions look like on Facebook? If you’re brand new to the idea, I recommend checking out Networking Engine Optimization, but in summary, you want to be creating content (and promoting content) that will get people to interact with your business page. More than any other factor, it seems pretty clear that Facebook determines the relevance of something by looking at the interactions of their friends (whether it be comments, likes, new fans, wall posts, etc.). Create a page with no interactions and expect to have a relative “black hole” in Facebook in the same way that a website without any inbound links is essentially a black hole to Google. Posted on April 20, 2010 April 21, 2010 Author Dustin LutherCategories Facebook, Marketing, StrategiesTags ads, Facebook, listings, neo, promoted posts, SEO4 Comments on REALTORS: You can use promoted posts to showcase your listings! Google is best used to target search traffic, while Facebook is best used to target friends of existing fans. Google’s algorithms are optimized to figure out what you’re going to like (or click on) based on what other web searches are clicking on… and the industry around that is called SEO. Facebook’s algorithms are optimized to figure out what you’re going to like (or click on) based on what your friends are click on (I’m calling this NEO). You can use Google’s Adwords to buy targeted search traffic, which is relevant because you can surmise someone’s interest (or intent) based on the keywords they entered into Google’s search box. You can use Facebook’s Ads to buy targeted traffic, which you can make relevant by buying terms that are related to your business page. With Google, you can increase your relevance by sending paid traffic to more relevant pages on your site (i.e. not your homepage) that are likely to convert at higher rates. With Facebook, you can now send relevant people (i.e. friends of fans) to posts that are likely to convert at higher rates and having higher levels of engagement. In web traffic, it’s all about relevance and Promoted Posts are Facebook’s way of letting your pay to improve the relevance of any given status update by sending more (and hopefully relevant) traffic to the update! 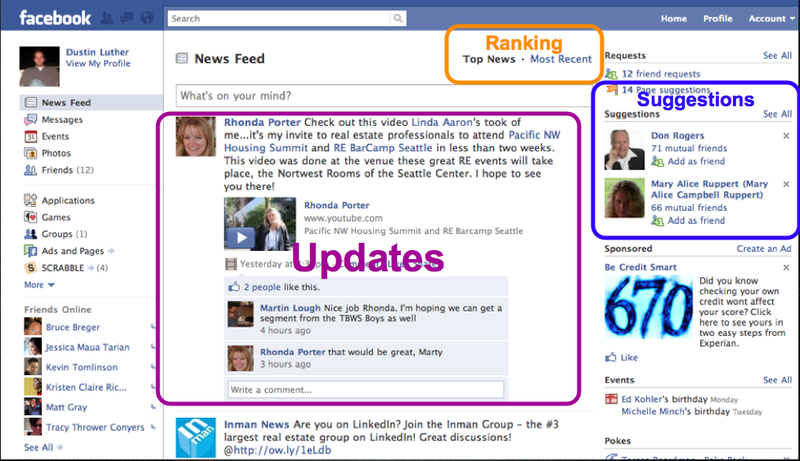 Facebook Promotion: It’s all about the status updates! Facebook is rolling out all kinds of changes to Fan pages today… but it wouldn’t surprise me if the MOST interesting change flies under the radar for just a bit. What is the most interesting change? The one I’m seeing is that you can now buy an ad for an individual status update! For those of us following changes to Fan Pages, this really shouldn’t be a surprise (I actually mentioned this change when talking about the future of Facebook at a recent Leading RE conference in Vegas)… But here’s why it’s interesting. When thinking about how to approach Facebook marketing, it’s all about Status Updates! I got some polite ribbing from the Roost guys at the same conference when I mentioned that agents should just roll their eyes at SEO and/or Tab “solutions” when on Facebook, but I’ll stick by my guns on this one. Don’t bother with any Facebook unless you’re planning on doing the hard work of generating status updates that will get people to interact. Anything else on Facebook is just work avoidance. Why are status updates so important? This has to everything to do with Facebook’s recommendation engine, or as I like to call it, NEO. Again, I’m gonna stick by my guns on this one as as well and say that going forward networking engine optimization, or optimizing content for the social networking algorithms, is going to become a huge industry similar to SEO today. So, if you want to get an idea of why these “promoted posts” are such a big deal, it has everything to do with the ability to get more activity on your status updates… even if you have to pay for it! In my early exploration of NEO, I was calling the concept FOF Marketing because the social networks do such a great job helping people reach the “friend of friends, friends of fans and/or friends of followers”, so thought it was a bit catchy… However, I don’t think FOF tells the story behind the concept as well as NEO. Posted on April 19, 2010 April 19, 2010 Author Dustin LutherCategories Digital Marketing Strategy, Facebook, Marketing, SEO, Status, StrategiesTags Facebook, neo, promoted posts, promoted updates, promotion, Roost, SEO, status updates, tabs18 Comments on Facebook Promotion: It’s all about the status updates! About two months ago, the HomeQuest team put on a real estate educational event in Portland that I thought rock’d… With four great speakers (Gahlord Dewald, Garron Selliken, David Gibbons and myself) and some help from some local title reps, we brought together a few hundred agents to teach them about how they could improve their online marketing. Make sure we have even more great speakers! So far, one local agent who has been rocking Facebook has agreed to be on the panel and I hope to announce the other two panelists in the next few days! Make sure the event is memorable! We’re going to make sure it’s the most cost-effective educational event for every agent who attends. Robin Milonakis: who’s been rocking the Facebook world. “AdSense” agent: I want one local agent who’s generates serious business from online ad buying to round the group out… If you have a recommendation for an appropriate agent, I’m all ears! Can’t wait to see you in the OC! Over the past 6 months, I’ve had numerous (too many to count) conversations with Garron Selliken about tools we could build for HomeQuest clients and/or M Agents… Rather than just building cool stuff because we *could*, Garron consistently brings almost every conversation about new tools back to an understanding of how the tool is going to fit into the Agent’s business flow. So much so, that I’ve completely reoriented my thinking and developed a mental model of the agent’s biz cycle in order to track where various tools and ideas fit into the work flow of an agent. After presenting this “mental” model to a few different audiences, I’ve realized that this model is not only providing the backbone for my presentations, but also for how we think of our product development cycle at HomeQuest… And because I’m using this concept as the backbone of the BuzzRE OC event we’re currently organizing for later this month, I thought I’d share this slide and my reasoning behind it’s importance. For many highly successful agents, the core cycle (sphere to prospects to clients to sphere ) is the basis for their “referral” business… which, even among “internet-savvy” realtors, is the main source of business for most realtors. The main reason I like this tool is that it helps shape how I think about various tools. In other words, an agent’s “hub” (i.e. website/blog/home search tool) can be an awesome lead generation tool, but only part of the story if good client management tools are missing. Other tools, like DocuSign, don’t add much to lead generation, but can be valuable in the client management stage of the cycle. And finally, some tools, like Facebook, Twitter, and even largely blogs, are awesome at sphere building, but rarely make for effective lead generation or client management tools. Are there any agent work-flows that wouldn’t fit into this cycle? Where does “your” product fit into this cycle? What parts of the cycle are most in need of useful tools?